Think eating bugs is gross? 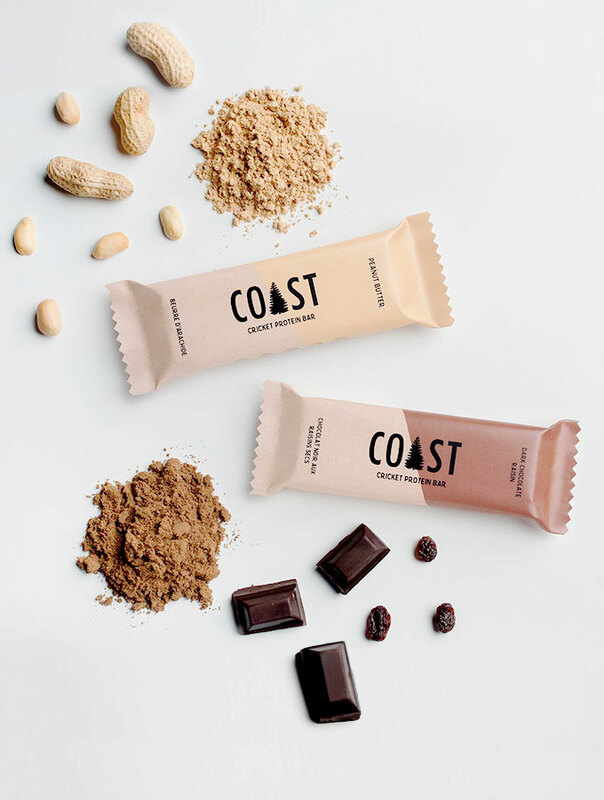 These tasty cricket protein bars from Coast Protein may have you reconsidering. Coast Protein is a startup from North Vancouver, and is the first company to bring cricket protein to Western Canada. Their product line includes a variety of protein bars and protein powders. I had the opportunity to try the bars: peanut butter and dark chocolate raisin, which are based around nuts, dried fruit and cricket flour. I never thought I would embrace entomophagy (insect-eating), but Coast Protein has these 6 legged creatures creatively well-disguised! Crickets are a complete protein, meaning that they contain all 9 essential amino acids needed for many functions in the body. Meats, dairy products, soy products, quinoa and buckwheat are also considered to be complete proteins. Incomplete proteins, like most grains, nuts, seeds, nut butters, green peas and legumes (such as lentils, chick peas, black beans, pinto beans and navy beans), are either lacking one or many amino acids. Crickets naturally contain fiber, B-vitamins, omega-3 fats, iron, potassium, calcium and zinc. Unlike meat, where only the animals muscles are consumed, the entire cricket is utilized, allowing for nutrients like calcium from the bones to be ingested. Unlike animal meats, crickets are low in cholesterol and saturated fats. Red meats and poultry skin contain saturated fats, which have the potential to raise cholesterol depending on the quantity consumed. Less emissions: Compared with cows, crickets produce 100 times less greenhouse gases for the same pound of protein. Less water: Insects hydrate themselves from the foods they eat, so they do not require extra water, unlike other animals. For example, per 1 lb of protein, cows require 2000 gallons of water, pigs 800 gallons of water, and crickets 1 gallon of water. Less land: Crickets require less than than other animal proteins. For 1 lb of protein, crickets require 15 m2 of land compared with cows, who require 200 m2 of land. Enter to win an assortment of Coast Protein bars by commenting below. All you need to do is tell me why you would like to try Coast cricket protein products! The winner will be chosen at random on April 4th at 5:00 pm (PST). The winner will be contacted via the social media outlet used to comment. OPEN TO CANADIAN RESIDENTS ONLY. I’m looking for alternate choices to meat protein and never considered “crickets” until now. (Good sell Carolyn!) The product looks appealing as a bar. I’m willing to try it! I am an RD who is interested in alternative protein sources. I love the idea of a low saturated fat and low cholesterol complete protein alternative. I am interested in trying the bars! I’m really curious about the taste. – As a regular buyer of protein powder and whey protein supplements I’m curious about alternatives and cleaner more sustainable options. Wow! These sound amazing. And those flavors! I have heard of cricket protein powders and bars but I have yet to sample anything. As a holistic nutritionist, health coach, and avid outdoors enthusiast, I am always looking for a healthy protein rich snack to keep me (or my clients) going. My passion for outdoor adventuring, whether it be hiking expeditions, camping, or beach strolling, extends into my deep love for the environment. So, a delicious protein bar that is environmentally sustainable? Sign me up!! Being mostly vegetarian, finding protein sources can often be a bit tricky, or get very repetitive. Bugs are something I would NEVER think about trying, but these bars look pretty interesting, I would like to give it a shot! Beginning to educate myself on non animal protein sources. These bars sound delicious and have a low environmental impact. Would love to try them! I want to try Coast Protein because I want to support sustainable food choices! curiosity, Love trying new products before I recommend them.